The mood in the bedroom has to be just right. Too bright and you’ll find it impossible to get to sleep, too dark and you’ll never wake up feeling fresh. 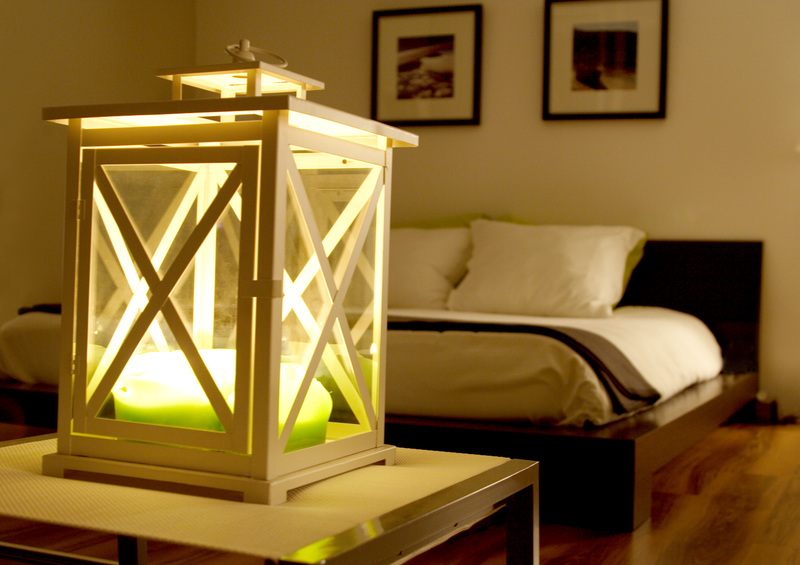 So, how can you achieve that perfect balance to create blissful bedroom ambience. As we highlighted in our Room Ambience Infographic, blue is the colour to choose for your bedroom. It’s reminiscent of the sky and sea, which naturally has a calming effect. It has even been scientifically proven to help regulate your heartbeat meaning you will drift off into a peaceful slumber. Here’s a few rooms that have taken this into account and got it spot on. 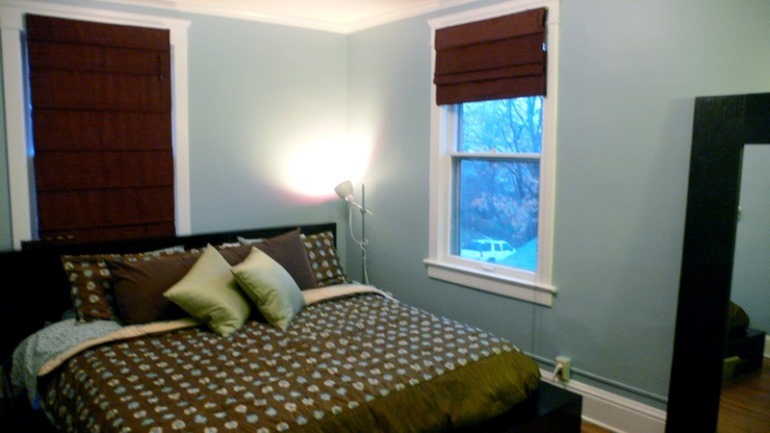 In the below bedroom, instead of painting the walls blue, they have gone for blue accessories. 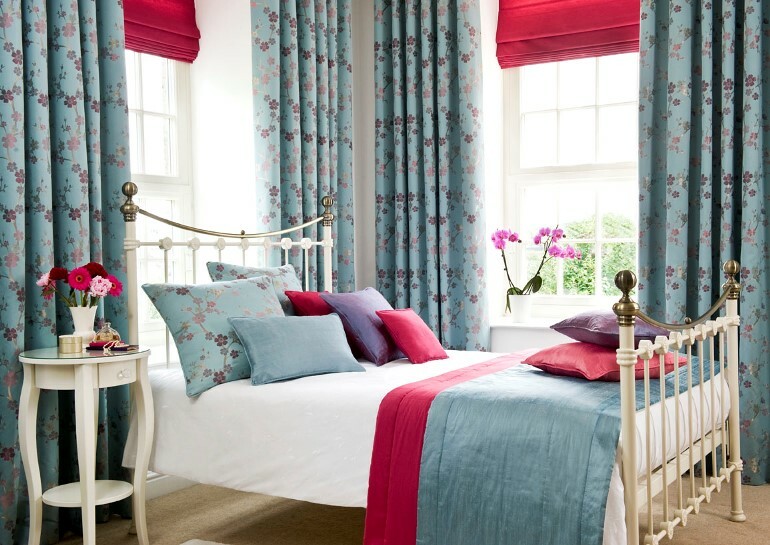 As there are two large windows here allowing a lot of light into the room, the full length curtains are bringing the calming blue affect in the evenings and the floral pattern enhances this further making you feel closer to nature. This navy room is full of character, effortlessly contrasting the white accessories and furniture with the bold navy walls and curtains. I love this room and think it would be a great bedroom to get a good night’s sleep. This bedroom has used a very cool, duck egg blue in the room, combining it with brown to create a chilled out place to unwind and sleep. It looks so cosy and the use of a lamp in the corner of the room tells us they’ve already read point 2. Soft lighting is so important in the bedroom. 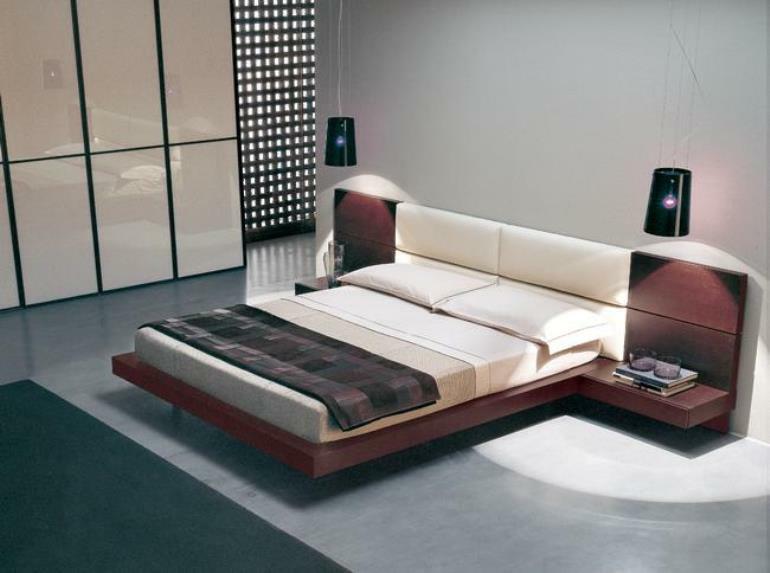 If the light is too harsh then you will struggle to unwind when you clamber into bed. If you don’t have any lamps or wall lights in the room, stuck with a blinding bulb in the middle of the room, lampshades and mirrors can be used to create interesting and soft shadows around the room. 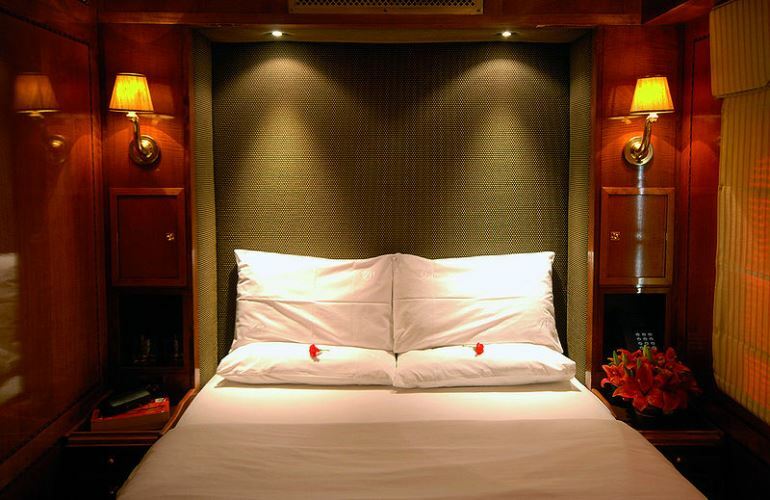 This bedroom from the Blue Train is a perfect example of lighting done well – LEDs above the bed and lamps either side of the bed provide sensual ambient lighting. The below bedroom concept from Bedzine is using black lampshades to provide a soft glow for the room. This was our final tip from the Room Ambience infographic. 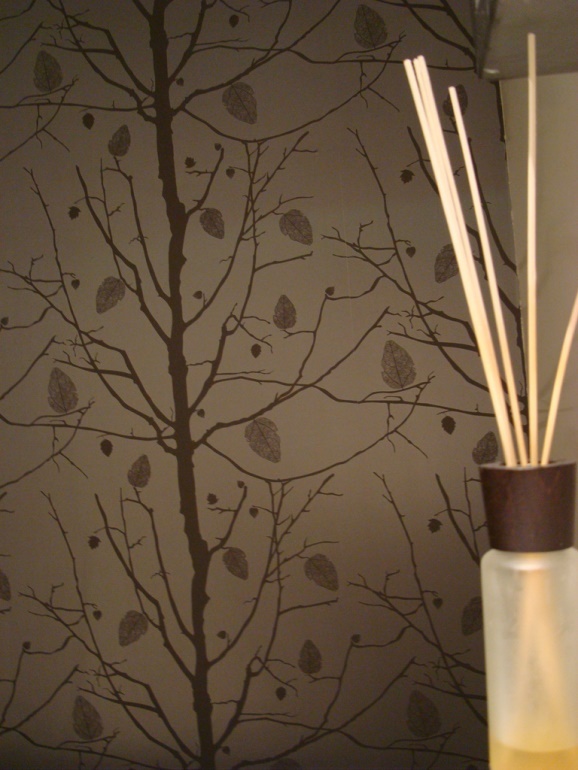 The use of essential oils, fragrances and scented candles can really aid our sleep. Think the smell of fresh bed sheets every night. Ylang ylang has been known to calm palpitations, hypertension and tachycardia. This bedroom has taken our advice on board, embracing the ambient lighting with a scented candle – two birds, one stone! Top tip – If you’d rather not have candles, incense sticks or aromatherapy paraphernalia around your home, you could add a drop of your favourite scented essential oil into your washing detergent. This will make your sheets smell amazing and do the same job as essential oils. The best bedroom ambience is relatively easy to achieve, these are some simple methods to help you on your way. How do you create the perfect bedroom ambience? Leave us a comment with your hints and tips.